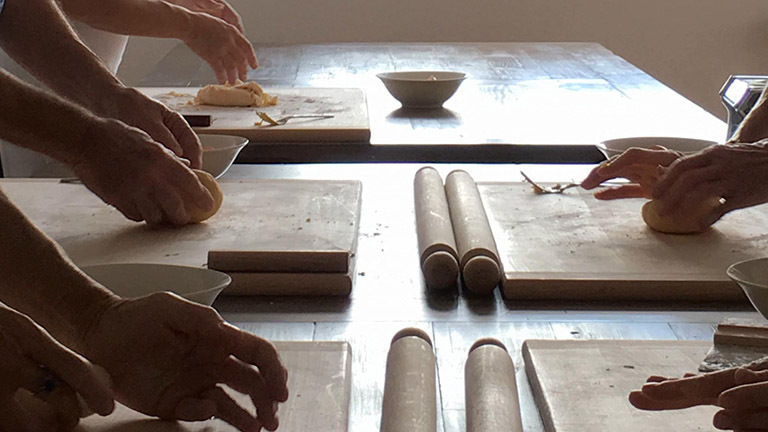 Learn how to make fresh handmade pasta in the time honoured tradition of the kitchens and restaurants from the Emilia-Romagna region of Italy. In this two hour workshop chef Stefania Ugolini will explain the importance of selecting quality ingredients, how to mix, knead, and roll the pasta, how to cut it into basic shapes such as Tagliatelle, Pappardelle and Taglioline and how the pasta should be stored and cooked. Build on the skills you learned in the Basic Pasta Workshop to create delicate filled pasta shapes such as tortelloni, tortellini, ravioli and mezzelune. In the capable hands of chef Stefania Ugolini you will learn which filling to use in each type of pasta, how to wrap the fillings into these beautiful traditional shapes, which sauces to serve over each pasta and how the pasta should be stored and cooked. Two hours - $110 per person. The minimum Pasta Workshop class is four people and the maximum is eight.